Gout flare-ups can cause sudden, severe attacks of pain, redness, swelling and tenderness of the affected joint. Gout can affect any joint, but is particularly common in the big toe. Usually, acute exacerbations of gout last about 3 to 10 days, followed by asymptomatic periods before another flare-up occurs. Unfortunately, there is really no cure for gout, only medications and life changes can help to stop pain. 1. Drink a lot of water. Painful flare-up of gout is caused by increase levels of uric acid in the blood, which causes the formation of urinate crystals in the joints. Drinking a lot of water can help flush out uric acid in the blood. Drinking alcohol does not reduce uric acid levels. In fact, beer increases blood uric acid levels and restrict uric acid excretion by the kidneys. 2. Be careful what you eat. If you have gout, you have to be careful what you eat. Some foods contain a lot of purines, and this substance when broken down by the body turns into uric acid. Start on a healthy diet and avoid foods rich in purines like herring, mackerel, mussels, red meat, innards, lentils, dried peas, asparagus mushrooms and spinach. 3. Take supplements. Food supplements may help reduce uric acid and prevent gout flare-ups. 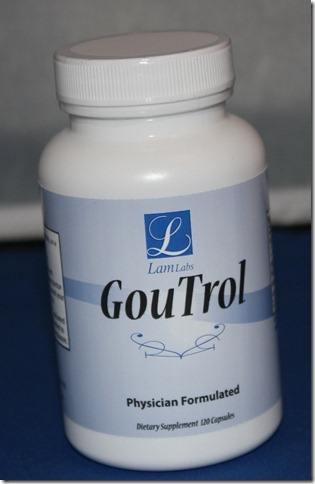 Goutrol is an excellent product because it contains vitamin C, wild cherry, alfalfa, apple cider vinegar and garlic. Vitamin C can reduce uric acid levels in the blood. The other ingredients contain antioxidants which can also help lower uric acid and prevent gout pain. 4. Hot and Cold Compress. During acute exacerbations, alternate hot and cold compress every three minutes. This can help alleviate pain, swelling and improve circulation to the affected foot. 5. Elevate. During acute gout pain and swelling, it’s a good idea to elevate the foot. This technique prevent pooling of blood and other bodily fluids on the foot, thus reduce swelling.